Practice Food Engineering questions and answers for interviews, campus placements, online tests, aptitude tests, quizzes and competitive exams. This set of Food Engineering Multiple Choice Questions & Answers (MCQs) focuses on “Principles of Food Preservation by Canning-1”. 1. What could be the possible reason for the minimal use of MSG in preserved/ canned food items? Explanation: Mono sodium glutamate (MSG) contains glutamates which are a derivative of glutamic acid and hence this inhibits the development of spore formation which is required by the cell to survive better in adverse conditions. 2. Which of the following is true about spore formation by cells? Explanation: All of the mentioned is true about spore formation by cells. 3. Which of the following sentences is NOT true? Explanation: Cell protein does NOT coagulate in the absence of air. 4. The non-functioning of the enzymes in bacteria is a major reason of death of bacteria. Explanation: This statement is false because a suspension containing 99% dead calls had their enzyme activity still on. 5. Decreasing enzyme content is not a cause but rather a consequence of inhibited growth. Explanation: Coagulation of proteins or a certain mechanism is a reason for the death of cells observed by the following experiment – a suspension containing 99% dead calls had their enzyme activity still on. This experiment shows that enzyme activity has nothing to do with death but inhibition of growth does. Hence, these cells mus have had their enzyme activity nullified only when all the protein/mechanisms in their body were coagulated. Therefore, the statement – Decreasing enzyme content is not a cause but rather a consequence of inhibited growth, holds true. 6. Death of bacterial spores permits computation of death points which is independent of all explanation. Explanation: Death of bacterial spores is of logarithmic order and hence this lets us compare the heat resistance of species at different temperatures or of different species at the same temperatures. 7. Which of the following is true about lethal mutation? Explanation: Lethal mutation is brought about by inhibition of enzyme activity. 8. Which of the following methods is possible to kill bacteria? Explanation: It is possible to keep the time constant from previous calculations and maintain a certain temperature to kill bacteria. Bringing the temperature down to a certain value such that the bacteria die in 10 minutes is another method used in old times, called thermal death point. Keeping the temperature constant and keeping them at that temperature till the time they die is the latest method used called the thermal death time method. 9. Which of the following is true about death time curve method to sterilize canned food? Explanation: All of the mentioned points are correct with respect to death time curve method used for sterilized canned food. 10. Statement 1: Heat resistance of an organism is designated by the ‘c’ value. Statement 2: The ‘z’ value stands for the number of degrees centigrade required for the thermal death time curve to traverse one logarithmic cycle. Explanation: Heat resistance of an organism is designated by the ‘c’ value. It is the number og minutes required to destroy the organism at 121 deg C. The ‘z’ value stands for the number of degrees centigrade required for the thermal death time curve to traverse one logarithmic cycle. 11. There is an existing relationship between the heat resistance of a vegetative cell and that of the spore formed thereafter. Explanation: There is NO existing relationship between the heat resistance of a vegetative cell and that of the spore formed thereafter. The x-axis shows the temperature and the y-axis shows the killing time. This is with respect to spores in a suspension. Curve a = 100,000 spores/ml and b= 1,000 spores/ml. Above curve a is the region of spores killed and below the region b is the region of spores survived. Which of the following do we comprehend from the above? Explanation: 1. The area formed by the triangles is more when the spore concentration is more and since this region denotes the number of spores surviving, the first explanation makes sense. 2. Since the starting point of ‘a’ on the y-axis is higher than in the other suspension, the first statement makes sense. All the other statements definitely aren’t comprehended by the graph and some of them are only speculations by various researchers. 13. Between the following factors, which of the following have maximum effect on highly heat resistant spores? Explanation: Spores which are dried and subjected to continuous drying have higher resistance to spore formation. 14. Statement 1: The physical environment in which a spore is grown has minimal affect on its heat resistance. Statement 2: Freezing weakens spores. Explanation: The physical environment in which a spore is grown has minimal affect on its heat resistance. Freezing weakens spores. 15. Statement 1: Spores heated in soil directly are more heat resistant than ones which are mixed with sterile soils and then heated. Statement 2: Thermophilic bacteria which form spores in artificial media are more heat resistant than those formed on machinery in canning plants. Explanation: Spores heated in soil directly are more heat resistant than ones which are mixed with sterile soils and then heated. Thermophilic bacteria which form spores in artificial media are more heat resistant than those formed on machinery in canning plants. 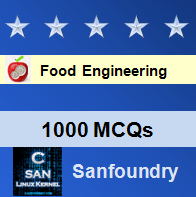 Sanfoundry Global Education & Learning Series – Food Engineering. To practice all areas of Food Engineering, here is complete set of 1000+ Multiple Choice Questions and Answers.